Having unpacked her bags on her return from Switzerland during mid June, Sudha next channelized all her energies into associating herself with the Dr. MLV Rasikar Manram, at their affectionate behest, for the 80th birthday celebrations of her beloved Guru. He whose devotion to the Lord is great, and who has as much devotion to the Guru, as to the Lord, unto him, that high-souled one, meanings of the sacred texts stand revealed. So it began, with this Guru Bhakti, the events on the evening of 3rd July at the Bharatiya Vidya Bhavan, Chennai. The program was anchored by Sudha and 48 hours were just not enough to bring to table the innumerable achievements, the facets, the memories, the creations…of this legend called MLV. An invocation by the disciples of the Grand Lady was followed by lighting of the kuthuvilakku by the Chief Guests for the day, Shri. N. Murali, Managing Director, The Hindu & President, The Music Academy, Shri. M.Murali, Managing Director, Sri Krishna Sweets and Shri. R. Krishnaswamy, President of Federation of Sabhas. Shri. T.R. Rajagopalan, Senior Advocate & Trustee of the Manram welcomed the gathering and Chandrika Rajaram, Secretary, detailed the tasks of the Manram and its future plans. Sudha spiritedly wielded the megaphone to entirely compere the show for the two days of celebration. When the Chief Guests began to speak, it was indeed a trip down memory lane. Shri N. Murali who inaugurated the function, emphasized on the wide spectrum of musical knowledge of the doyen. He made a special mention of MLV’s foray into areas of music which were hitherto considered exclusively male domains. Shri. R. Krishnaswamy recalled his family’s long association with MLV since 1945. Her commitment to her profession, when she came in an ambulance to perform at the Sri Krishna Gana Sabha during one of her ailing moments, her magnanimity in helping a lady in want, by donating her own mangalsutra, were all instances that proved beyond doubt her finer qualities as a human being. Shri M. Murali prayed that the doyen’s music lives on through her disciples, whose commitment to the cause was evident in the manner in which they had arranged the birthday celebrations. The disciples of MLV were presented mementos by Shri N. Murali, on behalf of the Manram. 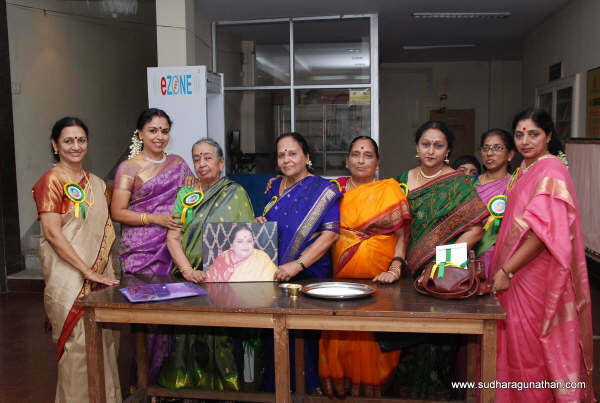 There was also a book release on the occasion – ‘Vasanthakumari Pillai Thamizh’, authored by Smt.Parvathy Gurumurthy. Shri.N. Murali released the book and the first copy was received by Sri Shankar Raman, son of MLV. The concluding event for the day was a grand violin concert by Kalaimamani A. Kanyakumari, MLV’s companion for over two decades. Along with Kalaimamani Embar Kannan and Shri. Sanjeev, she presented close to twenty numbers – nostalgic MLV masterpieces. The thukkadas all time favorites – ‘Ellam Inbamayam,’ ‘Aarumo Aaaval,’ ‘Aadal Kaneero,’ ‘Baro Krishnayaa,’ ‘Om Namo Narayana’ and ‘Innu Dhaya Bharadhe’ went down extremely well with the appreciative audience. Day 2 had some more surprises in store, carrying on the lingering moods of the previous day’s culmination – of MLV and her music that has touched the human souls across all boundaries of time, space, and genre. Sahitya shudha is what MLV emphasized upon each time and the power that she packed into each of her performances….! Endowed with a fluid voice and rich imagination, her rare musical artistry was an aural feast to both the lay and the cognoscenti. The evening commenced with a dance recital, “Aadal Kaneero”, a thematic presentation of evergreen melodies of MLV, by Shobana Ramesh and Aishwarya Narayanaswamy. The magic of MLV’s music was visible in the nodding heads and lip movements of the audience, in accompaniment to the songs playing in the back ground. The Chief Guests for the evening came on to the dais to relive their moments with the legend. Shri. R. Seshasayee, Managing Director, Ashok Leyland, recounted the days when MLV would visit them, where she walked in to his room while he was painting. Sitting with him for a while, she told him in child like innocence – “You teach me painting and I will teach you music”….and eventually he did learn music from the great stalwart. Kalaimamani Shri Madurai T.N. Seshagopalan recalled how she was responsible for his debut performance at the Shanmuganandha Sabha in Mumbai. MP Kanimozhi extolled upon MLV’s virtuoso and her humaneness, which she had read about many a time. The fitting finale for the celebrations was a concert by Sudha Ragunathan…another nostalgic journey into the realms of scintillating music. Accompanied by Kalaimamani Shri. Mannargudi Easwaran on the mridangam, Kalaimamani Shri. Embar Kannan on the violin and Shri. B.S. Purushothaman on the ganjira, she ensured the evening was memorable in ways more than one. Her affinity to MLV’s manodharma, her non pareil Dasara Padagalu, yet again gems from MLV, her racy renditions festooned by the spirit of MLV all bundled into an exotic concert. The Panthuvarali alapana (Raghuvara Nannu-Tyagaraja) an elaborate Bhairavi alapana, ‘Raka Sasivadhana’ (Dakka), ‘Mangalavaradhayaki’ (Kathanakuthoohalam) and ending with the evergreens ‘Harismarane Maadu Niranthara,’ ‘Yadavaraya,’ ‘Thikku Theriyadha Kaattil’ and ‘Chinnanjiru Kiliye.’….truly a reflection of the great Guru’s consecrated efforts into grooming outstanding disciples. The legend that is MLV lives on in our hearts. Introducing her to the newer generations and keeping her music alive will continually be achieved through celebrations and events such as this…which can become a success only with support of rasikas, who had turned up in hordes and thronged the auditorium, keeping alive the spirit of MLV and her music, ensuring that a tradition lives on. Sudha profusely thanked the rasikas and the curtains came down on what was a befitting tribute to the immortal Grand Lady of Carnatic music. At the end of it all one felt that MLV was in the very midst, watching, nodding, smiling and showering her blessings. Whatever a great man does, the other men also do whatever he sets up as the standard, the world follows.